It’s no secret that the central US is feels like a very humid oven right now. 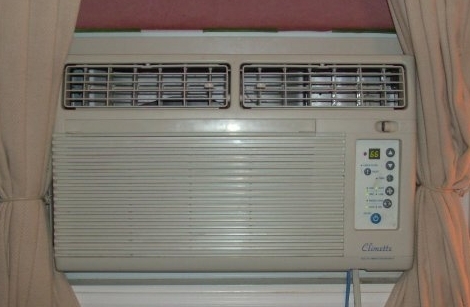 [Erik’s] window AC hack might help you out if you’re coping with triple-digit temperatures. He added network connectivity to the unit above but the picture is a bit deceiving. The blue CAT-5 cable that enters the bottom isn’t connecting directly to the network, but extends the up and down button connections for the unit to an external relay board. From there he uses an SNMP board to connect it to the network and uses PHP commands to reset the temperature. The unit has a working range of 66-88 degrees Fahrenheit so he cycles enough button press to reach the maximum or minimum level, then sets the desired temperature (avoiding the need to know what temperature the unit is currently set at). If you’ve got an AC unit with a remote control you could always use an IR device to patch into the system for similar functionality. My whole house HVAC system has an ethernet interface. it serves up a web page with info for the past 30 days. It came like this from the factory, just the installers were unaware of it and by accident left me the installer guide that showed all the setup info. Bryant furnace with Central air…. very cool info to gather from it. Ok I just have to ask, what is the point to this? The temperature regulation capability of these window units is not good, and I fail to understand why your taste for room temperature would change day-to-day? I set mine at one temperature, and have it turn on an hour or so before I get home…? or you can use X10 to control it wireless. No need the relay board, all you need is a computer that runs a home automation server (tons available on net) that communicates with X10 controller. That’s exactly what he’s doing – but this is a window AC unit, so not controllable from the main thermostat. He runs a cron job to cool his room an hour before he comes home. The ability to set the temperature to other values is just a perk. Also, to the people saying to control the power with a relay: This unit may not immediately begin cooling after being powered on. In fact, that seems like a stupid idea – that would mean if your power went out, your AC unit would turn on, no matter what. And sure, some of them might turn on immediately, but this model may not. I, for one, think this is a pretty cool hack. Though I agree with others who have said a quieter solution would be preferable, as well as a web interface (if you’re using PHP anyway…). But hey, as a quick and dirty hack, it’s pretty awesome. Instead of making an external temperature changer, it wouldn’t have been that much more work to make an ethernet connected thermostat to take over for the window unit’s shabby sensor set. I’m in the process of making one using an ATmega168 and a DS1775 I2C thermal probe. I JUST hooked up a new window AC and have it on an X10 appliance module. Controlling over the net via ioBridge and PSC04 serial transceiver. Works great as I rely on dual temp sensors also hooked up to the bridge. Allows me to schedule turn on times AND be reactive (if it’s hotter on a certain day, it will hit a threshold and automatically turn on the A/C until it gets comfortably below the threshold). I’ve worked on this, myself as well. I use a dedicated solid-state-relay controlled duplex outlet to control both a box fan and an air conditioner set to full blast. This connects to a parallel port on a tiny little Pentium I laptop I’ve got hanging around. Then, via serial, I use Maxim 1-wire temperature sensors to get an “overall view” of the four corners of my bedroom to calculate the averages, and then turn the AC and fan off/on as needed. On top of that I’ve got a Verizon Aircard in it activated on a prepaid MVNO so that I can control it via SMS and have it respond the same – and an Ethernet port provides me with a networked interface as well for any applications. I was going to do the same thing with mine. It is a really old unit and I don’t have a servo strong enough to turn the knobs. I wanted to patch something into it directly but it belongs to the land lord…. I was going to use IRC for the controls though. Anyway, I enjoyed this post. What I want to do is to add a motor to control my roll-top and to control this with a key combo on my AC’s remote. Tough task thats why I never did it. I did something similar to this with an arduino and a webcam. I made a RoIP setup with a hacked a motorola radio to change channels, set scan lists, power on, admin power disable, stuff like that. If he went the web page route it would be more than easy to throw a webcam in front of it.. I was able to hide all the ugly wires by modding the computer case and putting the radio and PS inside. Note: why not just use IR? that AC unit has a IR remote for it. it is brain dead easy to learn and repeat an IR signal. Plus that model has the timer function. I.E. read the manual and you can set it to turn on and off at times. Anyone have a hack to make a coffee maker make coffee? Yeah that model has a timer but it’s probably one of those primitive ones that requires you to set it each day to turn on in x hours. I usually remember to set mine every day but it is a pain to have to mash the timer button ten times to set it for ten hours. Also, I don’t like doing even simple math that early in the morning. When the electronics failed in my last window AC failed, I ripped them out and put in an electromechanical thermostat and a wall switch for the fan. Then I just plugged it into a wall timer. Not a hack though, just a repair. I know why he did this hack. Because he wanted to and because he could. The fun part of Hacking stuff is working with what you have to make it different. Who cares if he could have went and bought a new system that could do it out of the box. He had the parts and the know how so he did it! No money spent and the AC does what he wants it to do. Setpoints 66-68F? That’s a maximum setpoint of 20 degrees? Geeze, I’ve always felt Americans used way too much air con (does it really need to be freezing inside when it’s a warm summer day? doesn’t the differential when you go outside or come in get annoying? do you wear pants in the summer time? ), but never realized the hardware is set up to encourage it. In winter I like room temperature to be around 21-22 degrees. In summer a bit warmer is okay. Do people really like their rooms at 18?